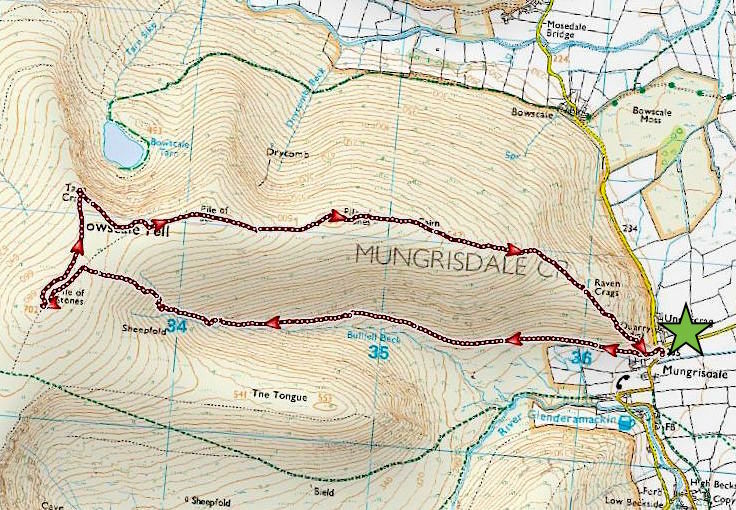 The forecasters have been telling us for days now that the weekend will bring dry and sunny weather so we planned to go over Mungrisdale for a dual purpose walk which we could both enjoy. The first section of the walk up Bullfell Gill and then back down again will be just about enough for a recuperating leg, while the second section will enable me to carry on up to the head of the valley and on towards Bowscale Fell summit. The path begins behind the houses in Mungrisdale and just a few yard further along we pass below Raven Crags. The path in the shot marks the beginning of the east ridge route to Bowscale Fell. Obviously we can’t go that route today but I will be using it for my return journey so in a few hours time this is where I will be ending my walk. The path is grassy and very gently graded all the way up to an old water works building so it shouldn’t put too much strain on the recuperating leg. Over the wall the large hill in the centre is known as The Tongue and to the left of it are Bannerdale Crags. A closer look at Bannerdale Crags since the snow is conveniently pointing out the steep route up the east ridge. A look back at the little hamlet of Mungrisdale as we stop to give the bad leg a rest. Without really being aware of it we’ve gained a little more height and begin to see the River Glenderamackin flowing through the valley bottom below The Tongue. On the other side of the river is Souther Fell and a very squelchy area between it and us. We saw two walkers starting to head across it to come over here but after a few minutes they stopped and retraced their steps back to the path alongside the river, so it must have been too much to deal with. Its not fun in sinking ankle deep, or deeper, in marshy ground. We continue on alongside Bullfell Beck and the old water works building eventually comes into view. Its very warm now and we’re beginning to feel the effects of the sun beating down on us. Despite appearances the path is gradually rising but its so gentle that very little effort is needed, but we have to keep to a slow pace for the sake of the injured leg. There’s no urgency anyway so we take our time and just enjoy the lovely weather. We reach the very unlovely water works building. I appreciate that its merely a functional structure but surely ‘they’ could have put a bit more thought into the look of thing. It doesn’t get any better on the other side either. This was as far as the injured leg was going today so, after a short break, it was taken back down again. You can make out the path along the fell side below and to the right of the hut. Providing there’s a signal when I get there I promise to phone and let ‘base camp’ back in Mungrisdale know when I’ve reached the ridge up there and then I set off for the steep climb ahead. The path becomes much narrower further up but its still discernible for now. I’m a good distance beyond the water works hut now as I pass by this old sheepfold and the steeper part of the climb is about to begin. Beginning the climb out of the valley and I’m still following the narrow path …..
…. but it eventually disappeared, as they often do over this type of terrain, so now it was ‘make it up as you go along’ time. As can be seen from the route map it makes little difference which way you choose to go because everywhere on this last section is very steep. As heather is a bit of trial to get through anyway, even without the steepness, I slowly picked my way across from one grassy section to another, and the far eastern fells eventually began to appear above the snowy slopes of The Tongue as I gradually gained height. Still climbing and now Souther Fell comes into view between The Tongue and the far eastern fells. Over on the right the top of Bannerdale Crags comes into view so there isn’t a great deal more climbing to do. At last, I’m almost on the ridge and I get my first glimpse of Blencathra on the extreme right of the skyline. As I pause to get my breath back I can feel something tickling on the back of my neck which turned out to be sweat pouring down it, and not a flying beastie as I had thought it was to begin with. Finally the gradient eases off and the view back down indicates the steepness of the climb, that was hard work in this heat. As I stood here it all felt rather odd because I have sweat rolling down my forehead and neck, I’m down to t-shirt level with my trouser legs rolled up to let the heat out, the sun is blazing down on me, there isn’t a hint of a breeze, I’m standing in snow and its still only March. A look back at the path coming over from the east ridge route and, over on the right, the valley I’ve just climbed out of. Having made the promised phone call to assure ‘base camp’ that things are OK all I have to do now is turn round and follow the path over to Bowscale summit. From the summit the view to the east of me is of Carrock Fell, on the right, with High Pike to the left of it. From the cairn a look back to the east ridge, my return route back down to Mungrisdale. The far eastern fells and the top of Bannerdale Crags from the cairn. The view before me as I sat with my back to the summit shelter and had something to eat. No need for shelter today since the air is absolutely still, so I just sit back and enjoy the hot sun and the view. I’m the only person here, something which I really appreciated and enjoyed as I watched the crowds swarming up and across Blencathra on the right of the shot. Sitting here and enjoying the peace and quiet on such a fabulous day was just lovely, and it was definitely a moment to be savoured and remembered. From the shelter the view to my right is across Mungrisdale Common beyond which are the Skiddaw fells. To my left a view of the east ridge of Bannerdale Crags with the eastern and far eastern fells beyond it. The Skiddaw fells beyond the summit shelter where I sat and watched the world go by for a while. A closer look at the magnificent and mighty Blencathra. One final shot before I start the walk back down, this time looking towards Lonscale Fell, the dark mass in the middle foreground, with some of the north western fells beyond it. I can’t believe I’ve spent almost an hour up here doing nothing very much, so I turn eastwards to begin the return journey and follow the trail of footprints, some of which were surprisingly deep, leading over to the east ridge. The snow was still firm and icy where it hadn’t been trodden so it was much easier to step in and out of the existing prints. I left the trail briefly in the hope that there might be a view of Bowscale Tarn which I walked up to a couple of weeks ago …..
….. but the view from this point was only partial and I wasn’t about to venture any closer to get a better one given the extremely steep slope beyond this point and the very smooth and icy snow covering it. Back on the path across the ridge and a look back at Bowscale summit as I make my way along the east ridge. A build up of thin milky cloud dimmed the sunlight for a few moments. Looking ahead at my route across the east ridge where the walking is easy at the moment. Further down the east ridge begins to swing away from The Tongue …..
….. and I take a look back to the marker cairn and the partial view of the summit area to the left of it. The snow covered eastern fells over on my right were looking very impressive so I thought they merited a closer look. The far eastern fells look equally impressive, especially High Street in the centre which looks to have a very good covering of snow. Moving the camera a little to the left and now HIgh Street is on the extreme right, in the centre is Rampsgill Head, and to the left of that is High Raise, all of them glowing in the afternoon sun. In comparison lowly Souther Fell, in the foreground, looks positively dowdy. I moved the camera a little more to the left with High Raise, now on the right, and the long ridge descending from it along to Wether Hill, Loadpot Hill and eventually Bonscale Pike and Arthur’s Pike. The snow is a long way behind me now and the gradient becomes more pronounced as the path leads me down towards Raven Crags and Mungrisdale. Over on my right is Souther Fell with the River Glenderamackin flowing alongside it. Now I have to negotiate the steepest part of the descent down Raven Crags. The path is very narrow, is covered in loose gravel and small stones, and it twists and turns sharply and steeply through thick and overhanging clumps of very prickly gorse bushes. For the first time today I got out the walking poles, not only to provide some stability but also to move the gorse out of my way, and reached the bottom without a slip or a scratch. On the way down I think I was more concerned about being scratched to pieces by the gorse than I was about succumbing to an unplanned sit down. All that remains to do now is cross the field, go through the gate, walk around the end house and I’m back on the road where the car is parked. Apart from the unpleasant section of prickly gorse I’ve had a very enjoyable walk in fabulous weather, and, apparently, its going to be another fine day tomorrow so we can go out again.